2.8 Zeppelin LZ 121 "Nordstern"
May was an interesting month for all developers, since we moved over to a different version control system: Git. With everyone being used to CVS, this took quite some time and in the end even a crash of the CVS hard drive! More about that in the Development News section. Despite the switch to Git, development continued in many different areas. Some of which include new or updated aircraft, detailed scenery, autopilot enhancements and even face tracking. This newsletter tries to give a good overview of the May developments. Enjoy reading it! Due to a hard drive crash, the FlightGear CVS server is offline since the beginning of the month. We determined that our efforts would be better spent migrating our repository over to Git instead of bringing the old CVS server back online. Onwards and upwards! Please see FlightGear and Git for details on how to access these new repositories at gitorious.org. The local weather system has been updated to version 0.61 by Thorsten. This is mainly a bugfix release and includes speedups in many areas and changes in cloud rendering. Several developers have been collaborating to make the autopilot system more flexible, allowing it express the kind of logic found in modern flight control systems without relying on Nasal helpers or custom C++ code. To this end, the expression syntax (used in XML animations) is now also supported in conditions, and in the autopilot inputs (including references). This enables mathematical and trigonometric functions, and operations like min, max and average, to be used in autopilot logic. Another addition is support for 1-bit storage elements, known as flip-flops in digital electronics, which allows many standard autopilot behaviours to be modelled with simpler, clearer XML and fewer helper properties. RS and JK flip-flop are available, as well as the less common D and T types - the RS type in particular is a good model of the 'arm/disarm' logic found in many automatic flight systems or modes. 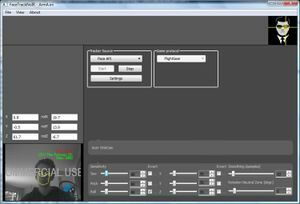 As an test-case for the new features, James is replacing the C++ autobrake logic with and XML version - once this is working reliably it will be installed in more aircraft, and should serve as an example for similar systems, for example auto-spoilers. In addition to adding these new features, there's been a concerted effort to document the existing components, and the new ones, and explain how to build a stable, working autopilot. A comprehensive reference page can be found here, and the how-to is here. Both are works-in-progress, and feedback is appreciated! See FaceTrackNoIR for the main article about this subject. Thanks to Wim Vriend, Ron Hendriks and our own FlightGear developer Melchior, Windows users are now able to look around by nothing more than rotating their head. This so called "face tracking" tracks the movements and orientation of a face that is captured by a webcam. Through an UDP connection, the tracker data is transmitted to FlightGear and used to move the current view. Altough the very first release was this month, the results are already amazing. I can tell you that looking around instead of panning around adds a whole new experience to your flights. See Boeing 747-400 for the main article about this subject. Gijs has been updating "The Queen of the Skies" with overhead panel backlighting, an (this time -thanks to Torsten- stable) autopilot making one of the best airliners in FlightGear even better. In the meantime, effort has been put into the cockpit shell and a 3D model of the upper deck. You can soon walk through the cabin, open the animated lavatory doors and nock on the 747's flightdeck door. Zexe and helijah worked at the Macchi M.33 and Savoia S.21 models. See the forum for more information and the download links. After teasing the forum-visitors for almost two months with amazing screenshots of the development, a beta version, of this stunning piece of art, has finally been released. The aircraft already includes an ultra complete cockpit, which really shows the eye-for-detail that its author has! Everything has been modeled, down to the pipes and wiring. For downloads and other info see the forum-thread. The aircraft is also distributed through our new Git repository. Did we say eye-for-detail? Here is another author that defenitely deserves that title! The Mil Mi-6 is being developed by Blender3D. It was first launched in June 2009, with an update in March of this year. Similar to the IAR-80, this helicopter has all the details that make the difference between a model and a replica. And with help from some of the best heli-developers attached to the FlightGear project, we can be sure that the FDM will look/feel just as good! Download and more info available at the forum. The Sukhoi-Gulfstream S21 is being developed by xsaint and should be out by late May. More information here. WooT implemented the ilec-sc7, a popular total energy compensated variometer for gliders. It is available in the Git data repository. More information can be found in the forum. The VMX22 was already mentioned in earlier newsletters, but its development progressed and it should be out soon, however unmapped. More information in the forum. Anders is currently working on the Zeppelin LZ 121 Nordstern and it has the basic parts of the propulsion, ballast and gas systems in place but much work remains on the instrumentation, systems and the 3D model . Nordstern together with her older sister ship Bodensee were designed by Luftschiffsbau Zeppelin in 1919 with medium range passenger routes in mind. Bodensee ran a regular passenger service between Friedrichshafen and Berlin during autumn 1919 and Nordstern, built in 1920 - 21, was intended for the same route with an extension to Stockholm. The development of European airports (like LIME in Italy; EDDF in Germany and others) has been very active, also during the past month. Europe has currently some of the most detailed scenery areas in FlightGear. 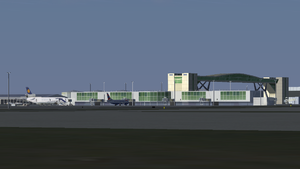 Further on in this newsletter you can read about the latest addition: London Gatwick. TaxiDraw was employed to update the existing AI taxiways in the current parking.xml file and should give a reasonably realistic feature for AI traffic. It is intended to improve the various aspects of taxiways in the near future. A useful readme file has been included and also three .stg files to help the user load Gatwick to the level of detail required. So, the UK now has a fully modeled major airport and it is now open to international FG flights - welcome to the UK via London Gatwick! The DC-6B was one of the world's first long-range commercial aircraft. It served under a variety of operators, and served as Air Force One during the 1950's. Its reliability and toughness has kept examples of it in service today. Now, about the FlightGear model. Aesthetically speaking, this model is great! The model is highly detailed in various places, and it has an accurate, well made 3D cockpit All the (old-fashioned) gauges work perfectly, and they look good as well. The control column and rudder pedals are animated too. My only gripe about the model is the lack of a throttle quadrant. 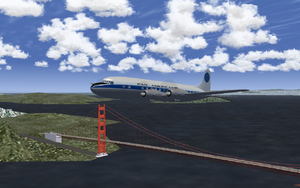 The DC-6 flies nicely, too. It isn't too responsive, and isn't too sluggish either. I cannot comment too much about the flying characteristics, however, as (sadly) I've never flown a DC-6 in my life. The DC-6 sounds nice as well. From starting to cruising, the engines on this bird are music to any piston engine fan's ears. My only complaints about this model are minor, such as the lack of flap and landing gear sounds. Or the lack of seats and/or cargo in the cabin of the DC-6. A very, very nice video showcasing some of FlightGear's features has been uploaded by "TheMasterofmod". It covers lots of features, including a carrier takeoff, Los Angeles International Airport some formation flights and lots more! New in the "FlightGear HowTo" serie by Oscar, is a crosswind landing tutorial. Altough his flying skills are not yet top of the notch, his tutorials are! Do not forget to take a look at his channel, with all the howtos in one place. 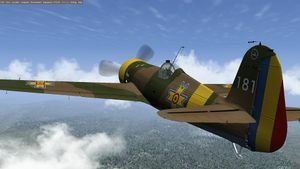 Once again, FlightGear will be present with an own booth at the LinuxTag (9-12 June) in Berlin, the capitol of Germany. LinuxTag is the most important place for Linux and open source software in Europe. The booth will be run by an experienced group of FlightGear enthusiasts. 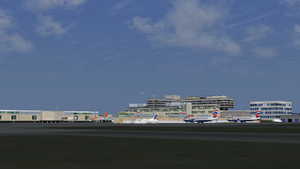 There are plans to present up to three FlightGear installations, each of them with a tripple screen setup. An internet connection should be present, so you might want to have a look at increased activity in the greater Berlin area. For those who are planning to visit LinuxTag be sure to stop by and say "hello". You can find the booth in hall 7.2b. We will be next to Mozilla and the LinuxGamers. This page was last modified on 14 March 2016, at 07:18.